Storey Publishing, LLC, 9780882669656, 288pp. In this comprehensive guide, Susan Miller Cavitch covers everything you need to know to make your own soaps. Learn the basic techniques for crafting oil-, cream-, and vegetable-based soaps, and then start experimenting with your own personalized scents and effects. Cavitch provides tips for making more than 40 different specialty soaps, showing you how to design colorful marbled bars and expertly blend ingredients to create custom fragrances. You’ll soon be making luxurious soaps at a fraction of the cost of boutique products. Early printings of this book contain a recipe variation in a sidebar note on page 36. As a result of further testing, author Susan Miller Cavitch and Storey Publishing strongly recommend that you do not try this variation. Adding honey when you are combining the sodium hydroxide and water may result in a stronger reaction with more intense heat. The mixture may bubble up quickly and come out of the pot, posing a potential hazard. Author Susan Miller Cavitch is the founder and president of Soap Essentials, Inc., a Memphis-based retail mail-order company producing homemade herbal products. She is the author of The Natural Soap Book and The Soapmaker’?s Companion. She lives in Eads, Tennessee. 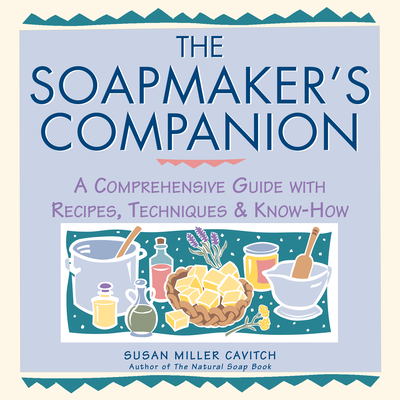 "The Soapmaker's Companion will teach you everything you need to know about making liquid soap; laundry soap; marbled soap; transparent soap; multicolored, layered soap; and more."